Have you ever played SkiFree, the free skiing game that used to come packaged with Windows? 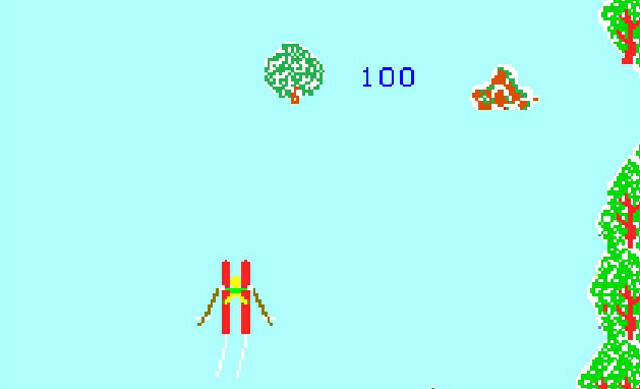 If you answered yes to that question, then you’ve basically already played Alpine Ski, a 1981 arcade game by Taito. In it, you control a skier on a downhill slope, a slalom course, or a ski jumping competition. One of the things I appreciate about Alpine Ski is that the win/lose scenario isn’t based on how many lives you have. Instead, you’ve got a set amount of time, and you get to play for that amount of time no matter how many times you fail. This means that you could always be certain of getting a specific amount of game time for your quarter. The controls are simple. You speed up and move left to right as you attempt to avoid obstacles. You can get more points by skiing over numbers, and the ultimate goal is to simply get the highest score possible. My highest score is a mere 5,293 points, which is measly compared to the world record of 500,773. A man named Eric Olofson got that score on November 23, 1982, which means it’s been over two decades and no one’s managed to beat it yet. If you want to go for it, be my guest. My best score is about 1% of Olofson’s, though, so I don’t think I’ll ever get there myself.